Getting a healthy dinner on the table can be challenging for families whether or not there are kids at home. It’s far too easy to grab fast or frozen convenience foods to throw on the table after sports practices, games, or music lessons. 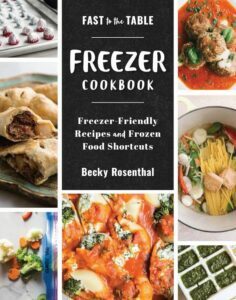 With the new Fast to the Table Freezer Cookbook, Freezer-Friendly Recipes and Frozen Food Shortcuts by Becky Rosenthal you can always have a delicious dish ready to cook when you get home. 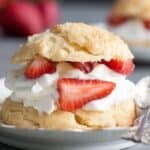 Some of the recipes can go from freezer to oven without thawing. 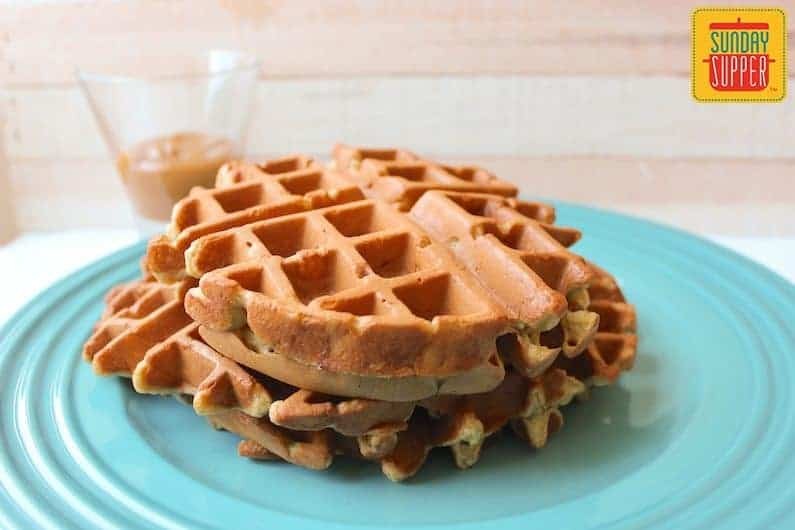 Others can be baked prior to freezing for an even quicker meal and all can be cooked right away as well, like these naturally sweet banana waffles. 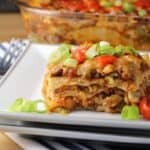 How wonderful would it be come home after a long, exhausting day to a meal ready to go into the oven? 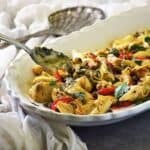 Wholesome, fresh dinners like chicken pesto pizza, Thai noodles with veggies and peanut sauce, chicken pot pie or roasted vegetable stuffed shells. Just add a salad and dinner is done. 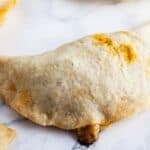 Once you are familiar with the freezing methods in the cookbook and what freezes well and what doesn’t, you can easily adapt your own favorite recipes to prep or make ahead and freeze. The freezer goodies continue with desserts too. How about lemon cream bars or brown sugar peach pie mid week? Either would be a delicious end to a long day. Butterscotch oatmeal cookie dough can be frozen so you can bake a few cookies at a time. 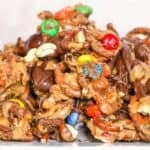 This is perfect for smaller families and empty nesters who just want a little something sweet. Mornings can be just as busy as evenings. Making breakfast, packing lunches, getting off to school or work can leave little time for a hearty meal. In addition to these delicious banana waffles, there is a nice variety of recipes for those busy mornings in the Breakfast chapter. Some recipes, such as the slow-roasted tomato and spinach quiche, make two so one can be enjoyed right away and one can be frozen for later. It would be great to pull out the chocolate chip hazelnut pumpkin bread the night before and have it thawed in time for breakfast. 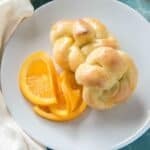 Ginger peach scones are perfect for grab, heat and go. If you know company is coming to visit, make up the maple raspberry baked French toast. 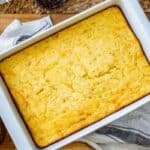 Before your guests rise, pull it from the freezer and pop it into the oven and bake. The delightful aroma is sure to wake them up. It really never occurred to me that you could freeze granola but the maple nut granola recipe can be frozen for future use or to give as gifts. Entertaining just got easier too. Make ahead and freeze appetizers and side dishes make party planning and holiday entertaining a breeze. Think easy holiday dishes like mashed potatoes with caramelized onions and roasted garlic and sweet and spicy cranberry relish. Both freeze beautifully to get a head start on those family gatherings. The Freezing Basics chapter is one of the best I’ve ever seen in a cookbook and I’ve read a lot of cookbooks. 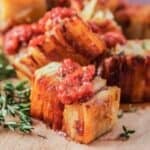 It covers getting your freezer ready, basic freezing supplies, including various containers for freezing, freezing methods like the divide-and-portion method, pizza method, casserole method and more. Then there are the common freezing topics like labeling, organizing, refreezing and even what not to freeze. The How To Freeze Food chapter is full of useful information. It teaches you how to freeze different fruits and vegetables, with a handy frozen vegetable chart as well as interesting freezer bag ideas. It doesn’t end there. The chapter will show you how to turn a pie pumpkin into 32 ounces of puree so if there is ever another pumpkin puree shortage you will be set. Other freezing topics include herbs, meats, rice and beans along with a freezer life span chart so you know just how long you can freeze foods. 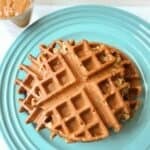 These naturally sweet banana waffles are easy to make but also freeze beautifully for a quick meal on a busy morning. Make the waffles: In a bowl, mix together all the dry ingredients. In a separate bowl, using a mixer fitted with the whisk attachment, whip the eggs until they are doubled in size. Add the mashed banana and whip for another minute. Make a well in the center of the dry ingredients and add the milk, oil, and vanilla. Mix just until combined, then fold in the banana mixture. Use a waffle iron to cook the waffles according to the manufacturer’s instructions, but leave slightly underdone if you’re planning on freezing them. Make the syrup: Heat the peanut butter and maple syrup together in a small saucepan over low heat. To freeze: Let the waffles cool, then freeze using the Lay Out and Freeze Method (page 14) on a parchment-lined baking sheet. Once frozen, transfer to a labeled gallon-size resealable plastic bag. Toast to reheat and serve. When you find ripe or overripe bananas on sale, you can mash them all and freeze them in an airtight container (in a portion size for your favorite recipe). 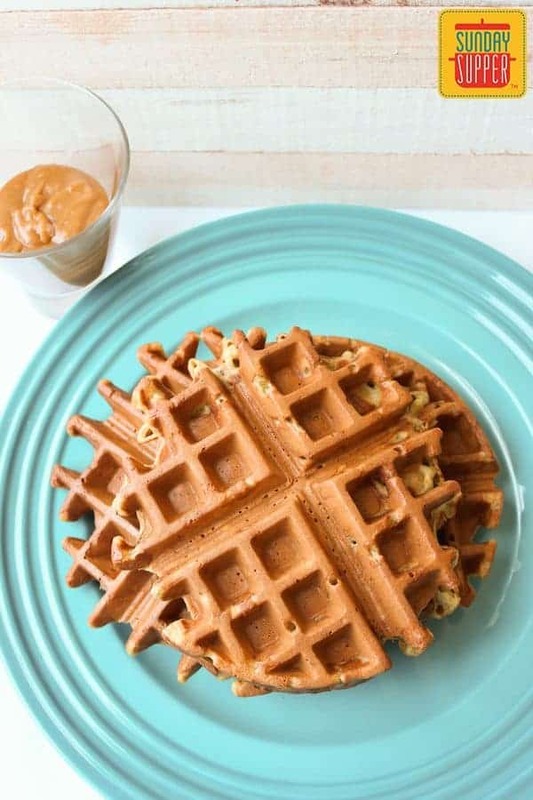 Banana bread, muffins, or these waffles are all great uses for frozen ripe bananas. Reviewer’s Note: The peanut butter syrup becomes thick as it cools so use immediately. If it’s too thick add small amounts of the maple syrup to thin to desired consistency. Do not rush heating the syrup, keep over low heat. Editor’s note: This recipe is printed courtesy of Countryman Press, ©Becky Rosenthal. 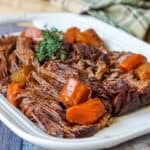 The author of this review received a complimentary copy of the cookbook, Fast to the Table Freezer Cookbook. No other compensation was received from the publisher. 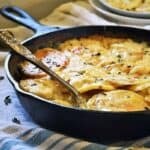 Links to the cookbook are affiliate links. Peanut butter and maple syrup mixed together is one of my favorites!! It would be lovely with these waffles for sure, but is also great on toast or ice cream.